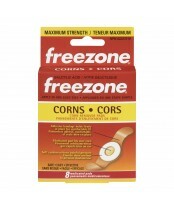 Freezone brand is used on the skin to treat common skin and foot (plantar) warts. The product contains two main ingredients: Salicylic acid and flexible collodion. Salicylic acid breaks down the thick top layer of skin and causes the wart, corn or callus to gradually peel off. Flexible collodion forms a protective coating over the treated area to help keep it clean and allows the salicylic acid and moisture to be in contact with the skin.